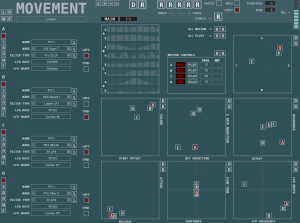 Movement expands on Motion by adding a further 16 Motion Sequencers which takes it into new territory. It is also capable of much simpler sounds with ease using the simple Randomizer which adds a lot more scope for it’s sonic potential. There was an attempt at simplifying the powerful yet complex interface of Motion by keeping most parameters but that could be edited using a single Panel. NOTE: Movement requires a full version of Kontakt 5.6, it will only work for 15 minutes in the player.